No man grows wise, says a voice from over 1,000 years ago*, without having his share of winters. I am having my share of Winter. I would argue I am accumulating wisdom: but my husband would not have agreed as I turned off the motorway, seduced by the siren call of a castle in the snow.If you must drive, goes British snow lore, then at least keep to the major routes where grit has had its wicked way. Venturing onto tiny village roads: that’s just asking for trouble. So I ventured onto a village road. Not very wise. Not only that, but when it turned into a track I opted not to turn back, such was my obsession with the castle at the end of the track. My heart sank as I surveyed the English Heritage car park. On a slant, and coated with sheet ice. I could get in all right, and park it: but would I ever get out again? I pulled up on that white glassy expanse. I held my breath to see if the car would slide in stately fashion to the other side: it stayed put. I was foolish, foolish, because of what sat watching me from the top of the snowy white hill. This was Donnington Castle. A ruin: Parliament voted to wantonly destroy this symbol of Royalist sympathy, and vanquished it in 1646. And its ruin has stood there ever since. People have lived there: there was even a ramshackle cottage put up against the walls of the gatehouse,once, but that has long since gone and now, Donnington Castle is run under the watchful eye of English Heritage. I had not brought the right shoes at all. Eschewing my wellies, I reasoned I was going primarily to Newbury, a nearby market town, and one cannot possibly wear wellingtons to Newbury in Berkshire. 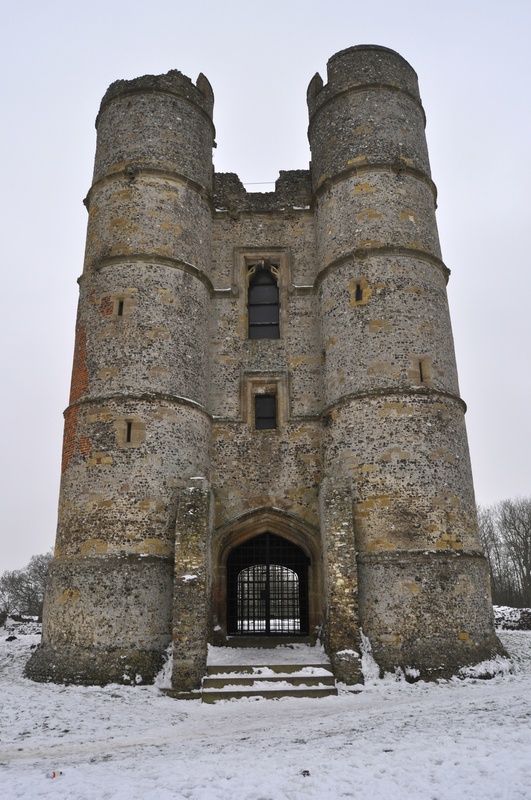 But my silly boots with no grip at all made the climb in the snow to the great and awesome gatehouse a glacial affair. Yet, because of the fortress on the hill, I picked my way gingerly upwards. And as I went higher I realised there was a stiff and chilly wind whipping the two towers. And like a mad old bag lady, my teeth chattered as I began to talk to the castle. Oh, you’re beautiful, I said, and my frozen fingers clicked on the camera’s shutter, in some vain attempt to record the wintry isolation of this place, far from the madding crowd. I devoured the two great towers and the windows which had centuries before lost their glass; crooned at the gargoyles, yes, which really were gargoyles, with water chutes as mouths. I trod the bounds and saluted the evidence of three ruined floors: fireplaces in the air, doors to death-defying drops, waste chutes, the vaulted ceiling inside the gate house. Because I knew what had happened there. I knew that a warrior who fought alongside the Black Prince was gifted the place in the fourteenth century; that Geoffrey Chaucer’s son in all probability bought it for his daughter; I know that Henry VIII and Elizabeth I were visitors, and Charles I claimed it as one of his strongholds in the civil war. I have seen places like this before: but somehow, here on this bleak white day, frozen white and deserted, the place possessed a silent eloquence. Staying for long was not an option. I could not feel my fingers. I slip-slid down the hill, to my waiting steed. And tentatively, and with infinite care, I eased it away from that icy imperious ruined palace, and towards the light and warm hearths of Newbury. *The voice from 1,000 years ago is the author of the Wanderer, an early English poem thought to have been written between 500AD and 900AD. Posted in Places to visitTagged Britain, castles, Donnington Castle, england, English Heritage, Geoffrey Chaucer, historyBookmark the permalink. Wow, I love the pictures. I would have taken just as many :-). The entire castle must have been incredible. Even this gatehouse is magnificent. But cold! I’ve often thought those old castles must have been miserably cold, drafty places to live. I’m so grateful to have been born in the modern era. I’d have made a terrible pioneer woman and a worse medieval woman. Well chosen pictures which have left me shivering. I too have suffered the embarrassment of ill chosen shoes on an icy surface. When I had a studio in Covent Garden I had to cross Waterloo Bridge each morning on foot. One snow bound morning I had chosen to wear cowboy boots which resulted in my having to crawl on hands and knees, through the rush hour throng, as standing up was not an option in those boots on an icy surface. Luckily no one noticed as rush hours crowds are like clouds of individual asteroids rushing along on their set paths, quite unaware of anything but themselves and their purpose:). I got The Devil’s Whore on DVD for Xmas Kate – it is a brilliant depiction of the Civil War. Great post as always! I saw in on Netflicks and really liked it. Lots of swashbuckle! We’ll go and have a picnic, Fiona. The dog would love it. Great pics although your wintry trek was indeed a bit unwise. I can imagine that Phil’s brow raised a bit. He doesn’t know, Lou, and I am shamefaced to say I did not proffer this post to him for a bit of professional proof reading as I usually do. We have a saying here….least said, soonest mended. Not sure it’s true, but today it suits me well. Thanks for braving frostbite and endangering your trusty steed so I could see your inspiring pictures! Katie, your comments always buoy me up 🙂 Thanks. Glad you enjoyed the pictures. Dear Kate, I have been a subscriber to your blog for awhile now and always open your posts first in my email to see what new delights you have uncovered. I love that you find ways to connect the ancient with the present(or vice- versa) and you have a wonderful knack for weaving them together to create unique and interesting perspectives and insights~ but you also amuse us too. I love history, art, poetry, architecture and the natural world so discovering your truly unique blog is such a continual joy for me. Thank you! Valkrye, now that is the sort of comment every blogger dreams of getting.Thank you: writing the blog is huge fun; it’s wonderful, after all these years, to have a repository for all the ‘stuff’ I accumulate. I really appreciate you leaving this today! Kate, the Intrepid! I could almost envision you making your way to the top and planting a flag! In my imaginings of English castles, this is what I see. I know it’s a ruin, but it’s the stuff of lore and I just love it–far more than the ones retaining opulence and more regal status. I completely and totally understand the need to see it, despite personal safety issues. Something just comes over us and the need is greater than the little voice of reason. I’m so glad you shared this gorgeous piece of history. 🙂 And I hope you’re staying in and warming up a bit now. You are very brave to have climbed this ice castle and your pictures are a testament to that bravery, Kate. I would have ended up sliding all the way on my southern half, crawling to the car, likely under the car as well. We are getting our first real dusting of snow here, right now, as I type, on a frigid day. We are breaking all records for no snow – some 330 or so days. I love the snow, just hope we don’t make up for lost time all at once. We worry about these things in Chicagoland. It keeps our minds off of the politicians. there’s lots out there for under £20 as long as your feet are under a size UK 9! In its heydey, I’ll bet it looked brilliant. Even now, it intrigues. I can’t blame you for going off the beaten path for these photos and story, Kate. That was a gutsy visit considering the severity of the weather, but I love the history you’ve shared about its past and, of course, the pictures. We just don’t have places like that here in NYC, but there is a church in my neighborhood that has 1785 engraved in the stone on the facade. Around where you live, that would be the architectural equivalent of an early adolescent. What an interesting castle! It must have been great castle in its glorious days. Your photos are well selected to present this historic castle. which must be rebuilt every winter. It is made from snow and ice. Whatever sacrifices you made, the pictures are worth it. Just gorgeous. I read this one days ago on my phone, back now to comment, because those photos are marvelous, especially in pairing with the history. Also, it reminded me of a folly in one of the parks near where I grew up (though our lacks some of the weighty abandoned longevity 😉 ), where, to tie it to another of your recent posts, the summer theater troupe staged “Romeo and Juliet” the year I was 16. I so love venerable buildings, and particularly castles. We are very short of them here. The mud huts of equal antiquity somehow didn’t survive, and all we have in the way of castles are fakes.